Forex chart patterns are one of the most attractive technical tools of trading forex. This post is aimed to explore the technique of finding trend reversal and trend continuation on the candlesticks charts. In the image bellow we see a triple top chart pattern with necklines. This type of triple top pattern, triple top neckline, is very rare on the candlesticks chart. In the image the triple top has resistance and support points are at same level, that is why we have two necklines one adding the support points and another adding the resistance points. After the pair made first top a throwback is found, next the pair made second top and another throwback is found, finally the pair made the third top. Importantly, the pair got support at same level after both throwbacks. In case of resistance similar picture is visible.This behavior of the pair made a rectangular pattern formation. Now the question is how to place orders with triple top chart pattern. 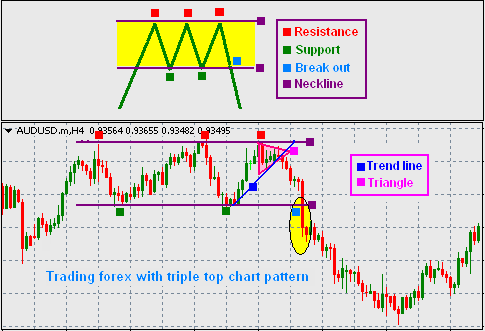 In case of this type of triple top pattern, traders should wait for any one of the necklines breakout. Both top or bottom neckline break out can take place. Generally, the bottom neckline break out is more effective in case of triple top pattern. So, enter into the pair when the neckline is broken out. Some smart traders make the triple top pattern more useful searching any other pattern formation break out on the third top. Here in this image we can see a symmetrical triangle break out on third top. Even some traders draw trend line with imagination. It is nice to know all about Forex online trading. I read your post and found it interesting one. It is very well written and your described everything in very clear & simple language.